Hi, Zermatt's escaping the worst of the current storm (so far), but is still likely to see anything up to half a metre of new snow over the next few days - wind is also an issue. The avalanche risk, and any associated piste (or road) closures, is very fluid and will change from day-to-day. Roads, of course, tend to be made safe as quickly as can be managed. When are you going to be in Zermatt? One of our forum regulars with a lot of local knowledge for Zermatt is Swingbeep, and regularly drops in with an update so look out for his posts! I am out of the region at the moment, so I can't give you any first-hand information. Zermatt seems to have received 50-100 cm of snow over the weekend, the avalanche danger at the moment is currently at 4 and the road from Tasch to Zermat is closed (it isn't open to the general public so this doesn't affect journeys to and from Zematt), the trains seem to be operating normally. Some of the easiest skiing is in the Gonergrat sector, depending on which is closer to your accommodation take the train or gondola up to Riffelberg and then the Gifthittli chair lift. 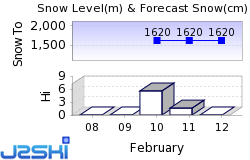 Significant Fresh Snow is forecast for Arolla. At least 55 Swiss Ski Resorts are reported to be open.